For the next 5 days, we’re sharing resources and daily challenges to help you bring Google’s free Applied Digital Skills curriculum to your classroom. This curriculum is designed to build your students’ digital literacy skills while developing life skills like collaboration, creativity, and critical thinking. Applied Digital Skills Week will help prepare you to use Google’s Applied Digital Skills with your students starting today! How to enter challenge #1, take a screenshot, photo and/or selfie of your Applied Digital Skills class and share it on Twitter, Facebook or Instagram with the hashtags #GrowWithGoogle and #EdTechTeam. Entries for today’s challenge will be accepted until 11:59 PM PST on Monday, October 8, 2018. We’ll notify today’s winner via direct message! 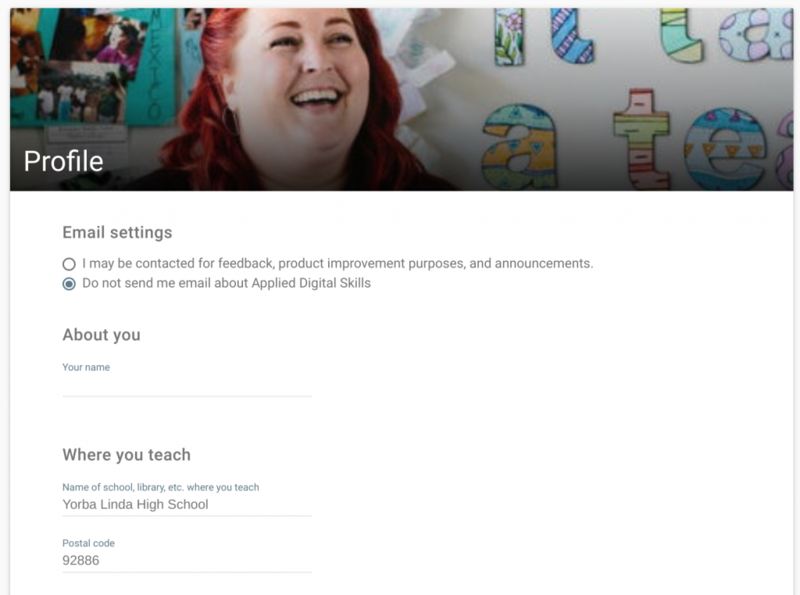 BONUS Challenge: Already have your students in an Applied Digital Skills class? Share a quote from a student who is using the curriculum in your class. Simply share the quote and tag with #EdTechTeam #GrowWithGoogle and you’ll be entered for a chance to win. To start out, you should know that your students don’t need to log in to Applied Digital Skills to use the curriculum. The content is open for anyone to see with or without a Google account. However, if you want to track student progress and see student reflections on their learning, you’ll want to log in to create a class and invite your students to join your class. Step 5: Create a class! Step 6: Your class is created. To see all your classes, click “My Classes”. I invite you to join me for a webinar on Wednesday, October 10 at 4:00 PM PST / 7:00 PM EST where we’ll be talking with a Googler from the Applied Digital Skills team along with teachers who have implemented Applied Digital Skills in their own classrooms. Sign up and save your spot. If you haven’t already done so, I also invite you to sign up for a free email course on implementing Applied Digital Skills in your classroom. Each day you’ll receive an email with quick tips on getting started in your subject area or grade level. There is even an email course for supporting second language learners with the Applied Digital Skills curriculum. I’ll see you tomorrow for the Applied Digital Skills Week Day #2 Challenge.